The court was later told of email messages between Mr Incedal and an unknown correspondent. Another, which mentioned "mo88m 55bayy style", could be interpreted as Mumbai-style attack, the jury heard. Jurors were told on Monday that parts of the trial would never become public. Proceedings on Tuesday afternoon are being heard behind closed doors - jurors are banned from ever disclosing what they hear. Ten journalists will be locked in the room with them to observe proceedings. They will also never be allowed to reveal what is said during the sessions. Critical Mass wrote: Erol Incedal? Good news guys... they did find Saddams WMD? Many of the old caches of chemical weapons were discovered around the ruins of the Muthanna State Establishment, described as the centre of Iraqi chemical weapons production in the 1980s. Since June, the compound has been under the control of the Islamic State militant group. "Many of the old caches of chemical weapons were discovered around the ruins of the Muthanna State Establishment, described as the centre of Iraqi chemical weapons production in the 1980s. Since June, the compound has been under the control of the Islamic State militant group." Ehrm **cough*cough** so the USA invaded Iraq in 2003 - but failed / forgot to secure the compound known to be (since the friggin' 1980's!) the centre of Iraqi chemical weapons production? 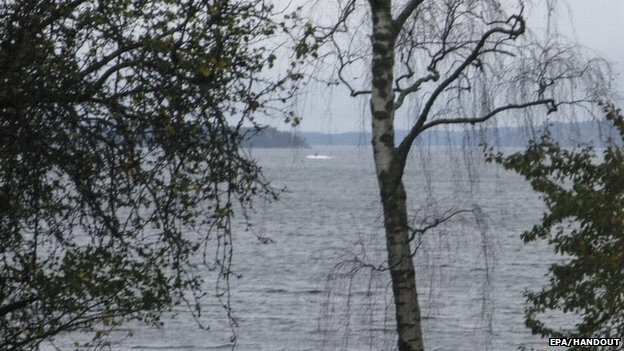 A Swedish source told the BBC an underwater vessel was spotted in waters about 25km (16 miles) from Stockholm. Russia's defence ministry denied any "irregular situation" involving its ships. "It's always about testing the Swedish response to see if we are awake and able to detect it... it's a way of testing our skills in detecting and locating." 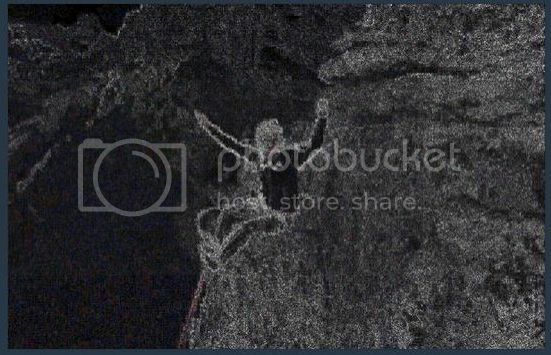 That's pretty visible for a submarine... it's seemingly on the surface and surrounded by froth or a wake? Perhaps it be Nessie rising from the deep? So next time you come across a girl with a face full of glass shards just pick her up & watch her immediately run off as good as new. 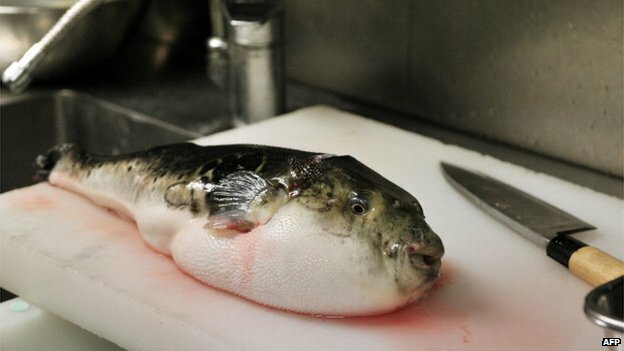 Perhaps puffer fish just like 11's? In the island town of Jomalig, Quezon, two children are dead and nine men were hospitalized on Wednesday after eating puffer fish for lunch, according to police. At about 11 p.m. the fish’s poison started to take effect. A wi-fi signal named "Al-Quida Free Terror Nettwork" (sic) has resulted in a long delay for passengers on a plane at Los Angeles airport. In a discussion about favourite wi-fi names on community site Reddit, users admitted to using titles like "FBI Surveillance Van", "ISIS HQ" and names that sounded like computer viruses to alarm passers-by. Agents said the bodies were of young as well as old animals, the official Andina news agency reported. 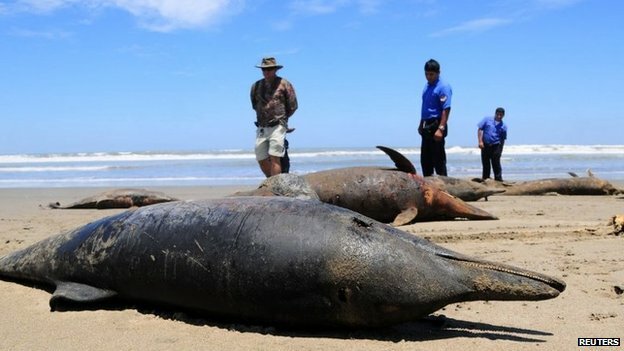 They were considered a health hazard and quickly* removed from the beach, which lies some 400km (250 miles) north of the capital, Lima. From what I can tell Fox news first broke this story. Peruvian news itself seems to be silent about 'the event' though they do report 50 dead Lions found early last year & 20 found 10 days ago. As I write this the international media is spreading the story verbatim with no fact checking in progress. 500, 50, 20... the media can't get the 9/11 'death' count straight so I suppose we should give them some leeway. Difficult to describe this story as News never mind a minor 'Anti-Putin' hoax... either way this appears to be another International media 'circle jerk' with one outlet quoting another which quotes another. Yet local news reports nothing untoward happening at all. Interesting to note the areas 'under attack' just so happen to be the location of a newly announced Chinese-Russian tourist venture which will include a Tiger Park. 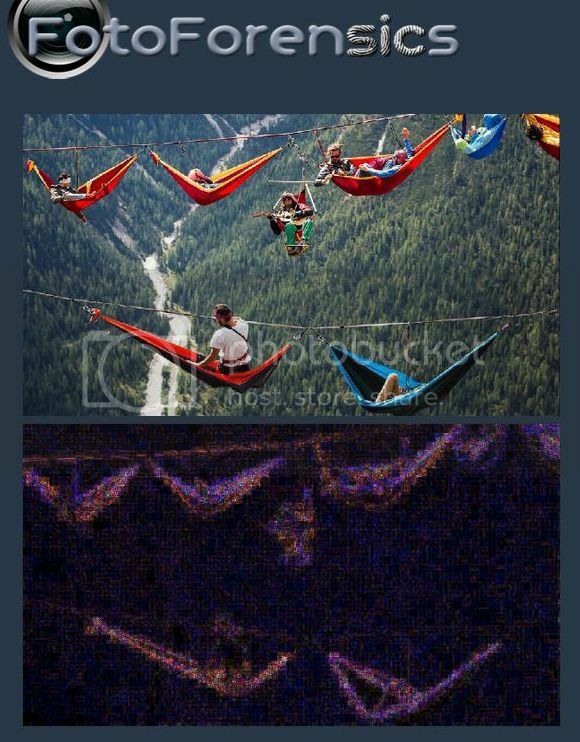 "A photo made available on Sept. 8, 2014 shows extreme athletes resting in hammocks on webbings stretched between rocks during the International Highline Meeting in Monte Piana, near Misurina, in the northern Italian Alps. 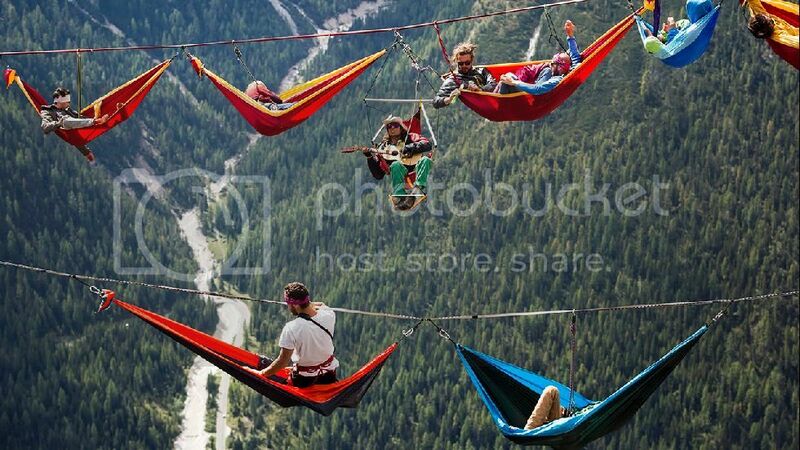 (Balazs Mohai/EPA/Corbis News Agency)"
That mountain climber sure looks pasted in to me! Konrad, 38, swam the equivalent of 290 lengths of an Olympic-size swimming pool after his 36-foot boat, which was on auto pilot, drifted away from him off the South Florida coast. According to the U.S. Coast Guard, Konrad fell into the Atlantic Ocean on Wednesday and only survived because he was able to swim nine miles to shore. The Coast Guard told WPTV in West Palm Beach, Fla., that Konrad was picked up at 4:40 a.m. on Thursday and taken to the hospital to be treated for hypothermia. Konrad had been fishing by himself when he fell in the ocean. According to the Coast Guard, Konrad's boat was on cruise control when he went overboard, so the boat continued on its predetermined route. Friends became concerned about Konrad's well-being when he didn't return home by dinner time. The Coast Guard estimates that Konrad was in the ocean for about nine hours. It's very interesting, this associating of number 44 with the name "Konrad" ( notice that it begins with K not C as it usually should be a case in English ). "Gustaw is dead Konrad is born" than there is something about national messianism and finally the line: " and his name will be 40 and 4 "
Mickiewicz was a high ranking free mason , very close friend of Giuseppe Mazzini and "Dziady" together with the majority of his work was directed against Tzarist Russia. His poems were very useful propaganda instruments. Polish disastrous, so called "national uprisings" ( I remember from school where I was brainwashed with our martyrology that none of our war-mongering poets ever managed to take part in these slaughters. They always were too late, sick, imprisoned or what not. How convenient ) in which the young had been dying in thousands achieving nothing but Elite's goals ( London, Vatican, DC, bankers, masons, etc. ) were always carried on with Mickieiwcz's slogans all over them. So is the case today when Masonic/"Jewish" controlled "nationalist" movement in Poland spills venom against Russia. Mickiewicz was born to a Frankist family, his maternal grandmother was a member of this sect. He died during the Crimea War in 1855 . Even some in the Mainstream are starting to question it all.